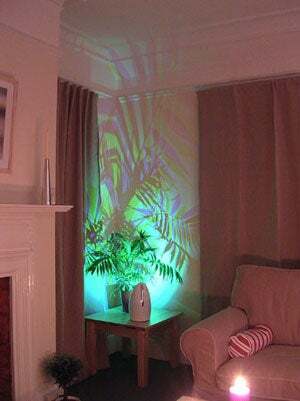 The Morpheus ambient lighting module promises to illuminate your room with all the colors of the rainbow. Looking no different than an ordinary lamp (well, more like an iron, actually), the Morpheus uses custom hardware and software to light up the adjacent walls with your choice of colors. In the middle of winter and want some warm colors to remind of warm sunshine? Melting in the searing heat thanks to a global warming-induced heat wave and need lots of blues to help cool you down? You get the idea. The clever lighting of your environment doesn't come free, however: expect to pay about $160 for the module alone, then shipping from the UK, etc. But hey, I'm willing to pay for trashy art decor.